Growing up in Australia with a Chinese father from Singapore and not knowing much about his background, I had always assumed that he spoke Chinese - after all, he looked Chinese and cooked what I knew to be Chinese food! I was surprised to later learn that he was a Chinese Peranakan, and that he grew up speaking something other than Mandarin. So what language do Peranakans speak? Gateway to Peranakan Culture by Catherine Lim. Peranakans, or to be exact, Chinese Peranakans - the offspring of Chinese traders and local women in the Malay archipelago - speak Baba Malay, also known at Peranakan Patois! 'Peranakan' means 'locally born' in Malay. Chinese Peranakans are not alone in their multiracial background. Chitti Peranakans are the offspring of local women and south Indian Tamil traders, and Jawi Peranakans are the descendants of marriages between locals and Muslim Indian traders. A Baba Malay Dictionary by William Gwee Thian Hock. The language of Chinese Peranakans has its roots in their history, which is said to be over 500 years old. With locally-born wives speaking Malay, ‘Baba Malay’ developed over time - a creole language of Standard Malay with a dash of Hokkien thrown in! Rich in metaphors and highly descriptive, Baba Malay is said to be full of imaginative expressions such as, ‘Harimoh mati tinggal kan belang, manusia tinggal kan nama.’ (the tiger leaves his stripes behind when it dies: a man’s reputation is all that remains when he dies). Gunong Sayang Association is based in Joo Chiat. In recent years, a renewed interest in Baba Malay has seen several study groups spring up. A local Peranakan theatre group called Gunong Sayang Association (mountain of love) has also been leading the way in promoting Peranakan cultural activities through music, drama and dance. Since 1910, GSA has been working to educate Singaporeans, particularly the younger generation, on the colourful tapestry of Peranakan culture. Embarrassingly, it’s taken me a few years to finally remember how to say this association’s name and understand more about the good work they do. With Della Ong, the elegant owner of Little Nyonya Batik. At the kind invitation of a Peranakan friend, I recently attended a play by GSA. It was my first Peranakan Wayang - a play performed in Baba Malay. Although the Peranakan community is small, I was amazed to see many familiar faces in the cast and crowd. In fact, it seemed like all the Peranakan people I know had gathered together for this occasion! The sheer enjoyment and pride on people’s faces was evident as they mingled before and after the play. For those fond of Sarong Kebaya, it was a feast for the eyes with Baba, Nyonya, and Peranakan fans alike decked out to the nines. The colourfully dressed cast of Peranakan Wayang Kain Chik Dua Mungka. Kain Chik Dua Mungka (Double-Faced) was performed by the legendary GT Lye, a 79-year-old Veteran Peranakan stage actor and female impersonator. Supported by a talented cast of local actors, GT Lye set the tone of the play as the powerful matriarch able to sprinkle her conversation with both scorching-chilli complaints and kueh-sweet compliments! GT Lye skilfully captured the movements of an older Nyonya (Bibik) such as flipping his long Baju blouse so it didn’t crush when he sat down. It was interesting to see other characters such as the 'majie' maids responsible for the housework and children. These female helpers from the Shunde province in China, who had sworn to never marry, are recognisable in their white tops and black trousers. An intrinsic part of many households in Singapore, many of those people raised partly by 'majie' remember them fondly as a part of the family. 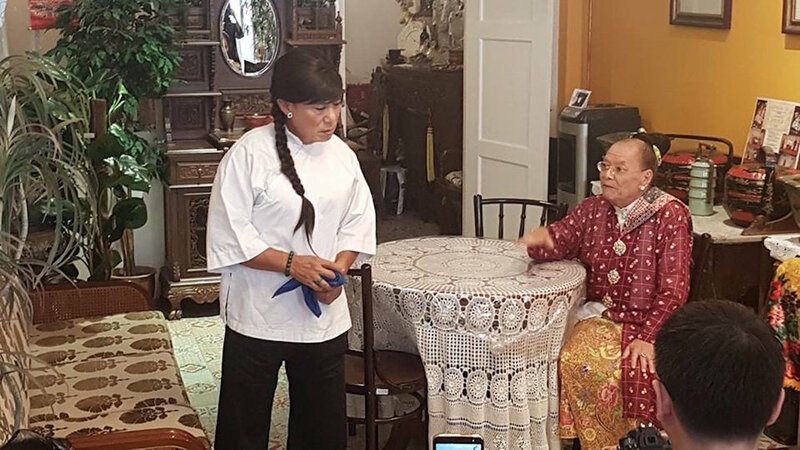 Veteran female impersonator GT Lye as Bibik Bisu with old family maid 'majie' Ah Nui. At first it felt a bit strange to hear Malay being spoken all these actors with a Chinese appearance. But the natural way they conversed, joked and conveyed emotion showed their deep connection with the language and its peculiarities. With the help of a LED board displaying an English translation, I was able to understand the general gist. Sadly, I could tell that I was missing out on a lot of the nuances and play on words and now feeling much more motivated to learn some Baba Malay. In Singapore, Peranakan cultural enthusiast and Peranakan Material Culture Facebook moderator Norman Choo, and GSA both offer classes. Studies underway for a new book project. I’m also very excited to be involved in a book project about Baba Malay. I’ve been reading parts of the book to my Malay speaking friends, and enjoying hearing their giggles. 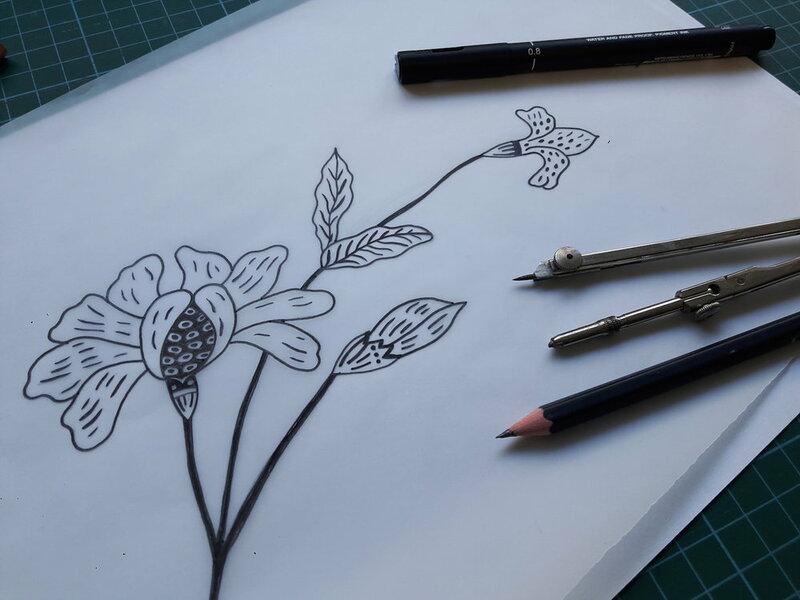 This project offers me the chance to learn more about Batik cloth, as well as motifs, flowers and images popular in Peranakan culture. I’ve been listening to music by my friends from Peranakan Sayang and munching on Kueh sweets to truly get into the mood! I look forward to sharing more details about this project with you soon! The talented members of Peranakan Sayang including Alvin Oon.